After a rigorous selection process based on the principles of openness, suitability, transparency, impartiality and democracy, the Colombian coffee growers elected Roberto Vélez as the new Chief Executive Officer of the Colombian Coffee Growers Federation (FNC). The unanimous appointment of the highest leader of Colombian coffee growers took place during the LXXXI National (Extraordinary) Congress of Coffee Growers, an event attended by the delegates of coffee producers from all over the country. Vélez Vallejo was elected after taking part in a process described in Colombia and abroad as outstanding; it began on July 2 with the publication of the new CEO’s desired profile, as defined by the Coffee Growers Steering Committee. The new CEO committed to working together with the coffee growers for the unity of the FNC and the sustainability of the coffee-growing industry; prioritizing the well-being of more than 500,000 families. Vélez Vallejo is an economist from the Universidad del Rosario (Colombia), with postgraduate education at the University of Brighton, in England, and New York University. He recently represented Colombia as Ambassador to Japan. He was also Ambassador to the United Arab Emirates and Malaysia. Vélez Vallejo worked at the FNC for 20 years, where, among other positions, he served as the Director in Asia and the Chief Commercial Officer. 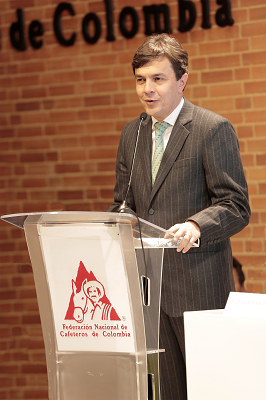 After the resignation of Luis G. Muñoz as the FNC CEO in May, the institution began a process to elect its new CEO under principles, criteria, and procedures clearly established by the FNC statutes. After assessing a list of 19 candidates who responded to an open call, the Coffee Growers Steering Committee selected eight candidates on July 15 with the best credentials to represent Colombian coffee growers according to the established criteria and profile. From this list of eight candidates, the National Coffee Growers Committee (made up of representatives of the country’s 15 departmental committees and the Colombian Ministers of Finance; Agriculture and Rural Development; Commerce, Industry and Tourism, and the National Planning Director) defined a shortlist of three candidates on July 21 - Adriana Mejía Cuartas, Roberto Vélez Vallejo and Luis Guillermo Vélez -which was presented to the National Congress of Coffee Growers, the highest FNC decision-making body. Finally, they elected Vélez Vallejo as the new CEO. The three candidates from the shortlist had many identical opportunities to present and explain their proposals to coffee growers and their delegates across the country. In order to do so, the FNC provided spaces and channels to each of them and supported them in conducting tours and meetings with all the departmental coffee growers committees. It is worth highlighting that the election took place in a of respectful and harmonious fashion between candidates; something that undoubtedly contributed to quality of interactions and discussions with coffee growers.